What does the word "church" bring to mind? 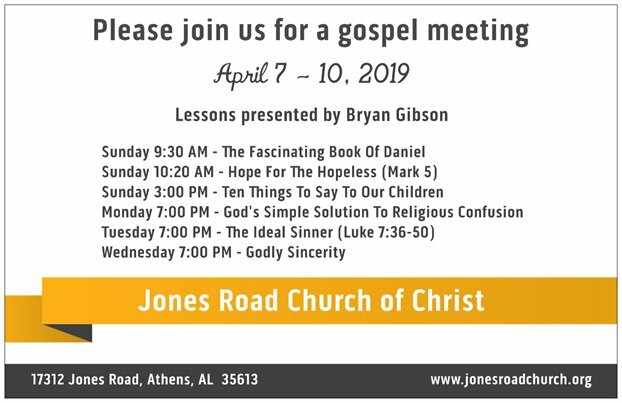 What is the Jones Road church? We are a group of Christians who have made it our aim to be no more and no less than that which we read about in the New Testament. We are “of Christ” because He is our Savior and King and our goal is to allow His word to control all we do. Our building is located nine miles east of Athens, Alabama on Jones Road. If you are in North Alabama, please stop by and visit us. You are always welcome!! Please click on the graphic below to listen to or download the recordings.